Striker Sam Vokes says he will miss the start of Wales' Euro 2016 qualifying campaign but hopes to be back from a knee injury before Christmas. The Burnley player ruptured his anterior cruciate ligament in a 2-0 defeat to Leicester in March. The 24-year-old scored 20 league goals before the injury to help the Clarets win promotion to the Premier League. "Hopefully, I will get back playing before Christmas," Vokes told Radio Wales Sport. "I had the operation two weeks ago. "It's quite a big injury, doing my cruciate [ligament], so I will be working hard over the summer to be fighting fit for the Premier League next season." Manager Chris Coleman stated the loss of Vokes was a big blow to Wales' already threadbare forward options. The Burnley forward had been expected to lead Wales' attack for their European Championship qualifying campaign following an impressive season for his club. 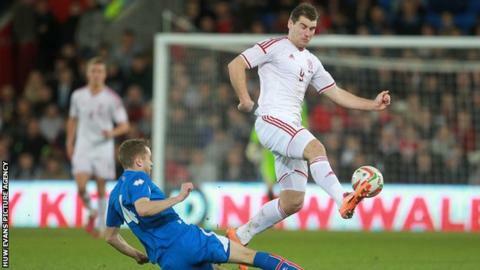 Vokes has scored six goal in 31 Wales appearances and was on the mark in the 3-1 friendly win over Iceland in March. But the former Wolves player confirmed he will miss Wales' opening Euro 2016 qualifier against Andorra on 9 September. "It's another kick in the teeth because we have a big qualifying campaign coming with Wales," said Vokes. "I wanted to be a big part of that, but that is another reason to get back fighting fit for those qualifiers. "I think I am not going to push the injury, it is going to take its time. When I am back fit hopefully I will be pushing for that too. "I have always wanted to earn the right to play at club level to give myself a chance at international level. "I felt I was doing that this season and have taken a knock with this injury. "It's something I want to do and have to fight my way into the side on the international scene." Despite being sidelined with injury for the final stages of Burnley's campaign, Vokes said getting promoted to the Premier League with Burnley was the highlight of his career so far. "It's a big highlight of my career and tops off a great season," said Vokes. "It's my second time, after my first [promotion] with Wolves. [It] means a lot to me personally, playing a bigger part."